Home » Why Was UFC Fighter Nate Diaz Vaping CBD Oil? 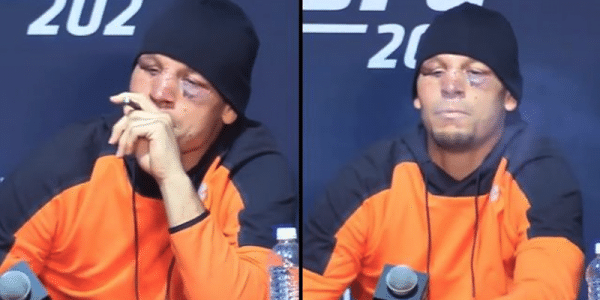 In the fall of 2016, USADA issued UFC fighter Nate Diaz a public warning for his use of CBD oil during an in-competition period. USADA didn’t penalize Diaz beyond a public warning because his drug tests came out clean. This comes as no surprise since vaping CBD with zero THC should not make you fail a drug test. Cannabidiol, or CBD for short, is one of the most abundant cannabinoids found in cannabis plants. Out of over a hundred identified cannabinoids, CBD has shown to have the most health benefits. CBD is not intoxicating, has fewer side effects than THC, and may be an excellent alternative to traditional painkillers because of its anti inflammatory properties. Diaz wasn’t getting high. He was trying to soothe some of his discomfort and pain. Fortunately, as of 2018, WADA allows for athletes to use CBD. Why was Diaz vaping CBD oil? Same reason many MMA and UFC fighters use CBD oil. CBD is considered one of the safest, plant-based supplements for pain — especially when compared to addictive prescription pain killers. One of the most significant properties of CBD oil is its ability to fight inflammation. Many diseases and health problems are rooted in inflammation. Inflammation causes pain and people often take conventional painkillers like ibuprofen (Advil) or acetaminophen (Tylenol) to stop the pain. There’s no doubt that Advil and Tylenol work. But these medicines have negative side effects like stomach problems. This is especially true when taken in high doses. CBD hemp oil may prove to be the safe and side effect free replacement needed for conventional pain medicines. Most users who take CBD oil report little to no side effects. And CBD is considered safe to use, even in high doses. If you looked like Nate Diaz after his bout with Conor McGregor you too would be reaching for something to help with the pain. I would rather use a natural compound from a hemp plant, a plant that’s been used by humans for thousands of years, over a bottle of painkillers and risk the nasty side effects. Sometimes when people suffer from insomnia it’s related to the pain they’re also experiencing. It’s pretty hard to fall asleep when you have some nagging pain keeping you up all night. What some people have found works well is using CBD oil for pain and for sleep at the same time. People report the CBD helps to ease pain and can also help them fall asleep more comfortably. There’s a guy I know named Denny. Denny unfortunately has type II diabetes. But CBD oil has improved his life. Denny’s diabetic nerve pain used to keep him up all night until he started using CBD oil. The CBD oil took care of two birds with one stone for him: no more pain, lots more sleep. Denny takes a dose of CBD hemp oil in the morning and then he augments that dose at night by vaping CBD oil. In addition to helping him sleep and relieve his pain, Denny told me the CBD oil keeps his blood sugar down! Pretty impressive. CBD oil has shown to be an effective pain reliever and so much more. I think that sufficiently answers the question of why Nate Diaz was vaping CBD oil at UFC 202. It’s because CBD works for him!